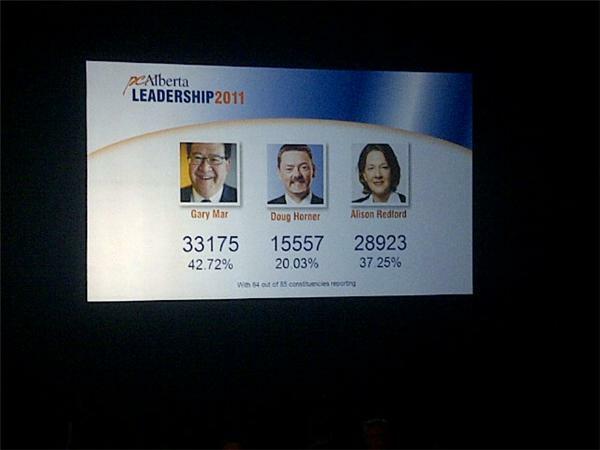 Global News keeps you up to date as the Alberta PC party elects a new leader on Saturday, October 1st. @VassyKapelos You have to tell me ....is Lukaszukmla as Gorgeous in person as he is on T.V.?? @stussijoy - can't you take a break from TV long enough to have something this important override it??? Interesting question.... did Stelmach give any opinion today on who he'd like to see succeed him as Premier, or did he give any prediction? Yes..thank you Global for continuous coverage which I believe is alot more important than some insignificant program like SNL!! vassy is AWESOME AND hot!!!!! @ MsClass...I have met Thomas Lukaszuk..he is my MLA and yes..he is a hot one!!! So if gary mar gets voted in, does the speed limit on the highways go up to 135km?? What's taking the Barrhead and Dunvegan ballots so long to count? Were they using wheat grains or what? the reason small c conservatives have no one to represent them is because the issues that concern them (abortion, gay marriage) are no longer relevant, and remember Danielle Smith is a libertarian, ouch what now? Don't understand how so many can vote for Mar...has everyone forgotten what happened when he was health minister....severe cuts, GNH almost closed, and half of our nurses went south! We need change from the "old boy's club" hope to wake up and see Alison as our new premier! Go Alison I hope you can flush some of the good old boys down the toilet. I hope the constituencies that are officially counted have begun counting Horner's second ballots otherwise we will be here until noon tomorrow. "Don't understand how so many can vote for Mar...has everyone forgotten what happened when he was health minister....severe cuts, GNH almost closed, and half of our nurses went south! We need change from the "old boy's club" hope to wake up and see Alison as our new premier!"